The third chapter of The Crest of the Peacock by George Gheverghese Joseph, which focuses on the mathematical developments of the Egyptian empires, starts with that important, and often-ignored point. Does it matter from a mathematical perspective that much of our mathematical tradition originated in Africa? I don’t know. But the implications on our general understanding of the world are huge. If I were teaching a class on these subjects, this would be one of the first points I’d bring up. 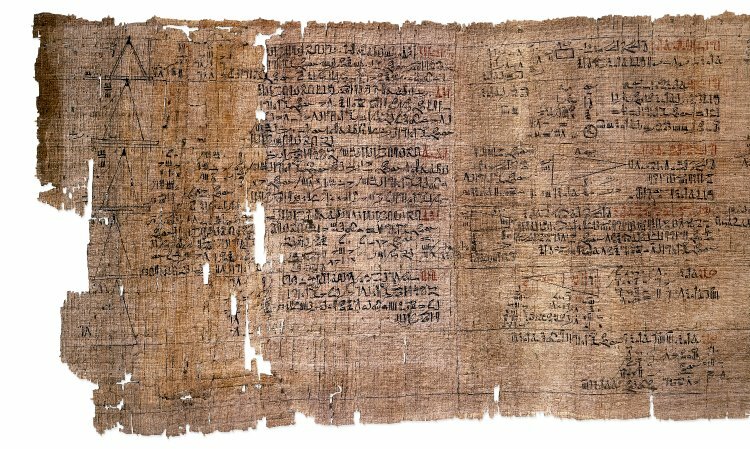 Ancient Egyptians wrote on papyrus, a thick, plant-based paper. Unfortunately, papyrus degrades over time and so much of what likely existed at the time of the ancient Egyptians has been lost. However, a few important pieces remain. The Ahmes Papyrus, also known as the Rhind Papyrus (because it was owned at one time by a man named Alexander Rhind) may have been used as a teacher’s manual. It has been dated to approximately 1550 B.C.E. A portion of the Ahmes Papyrus. It measures 13 inches tall and nearly 16 feet long. The Moscow Papyrus, so-called because it is currently housed there, dates to around 1850 B.C.E. Used a ciphered, non-place value, decimal numbering system. Were aware of the concept of zero but did not use it as a place value. Made extensive use of unit fractions like ½, though avoided non-unit fractions like ¾ (though ⅔ apparently saw wide use). Practiced rhetorical (rather than symbolic) algebra. This entailed a sequence of steps to solve a problem, but no operators such as +, -, etc. The unit fractions part is interesting because the ancient Egyptians did not use printed currency. As such, one might be paid for labor in the two most common goods of transaction: bread and beer. In a particularly interesting example from the text, imagine you’re an employer and you need to distribute nine loaves of bread among ten workers. Each worker would receive nine-tenths of a loaf of bread. One way to do this equally would be to cut a tenth of each loaf, distribute the nine-tenth shares to nine workers, and then the nine one-tenth shares to the remaining worker. Needless to say, this last worker may not think this was a fair deal (who likes the heal?). The Egyptian form of division, strange as may seem to us today, would’ve resulted in the following result: seven workers would receive three pieces, 2/3, 1/5, and 1/30 of a loaf. The other three workers would receive four pieces, two 1/3 pieces, a single 1/5 piece, and a single 1/30 of a loaf. I’m not sure what I’d do with 1/30 of a loaf, but you can see that this would likely appear to be a fairer result in the end, if only because each person’s share would look similar. This brings up an important point: the number systems and mathematical procedures of a culture are a reflection of the practices of that culture. I wouldn’t want to do calculus using only the tools that the Egyptians had, but then again, they weren’t doing calculus. They were dealing with the trade and distribution of goods in a non-monetary economy. And for that their system made perfect sense. Approximate the area of a circle. Calculate the volume of a frustum (a truncated pyramid). It has also been proposed that the ancient Egyptians were able to calculate the surface area of a hemisphere, but Joseph is skeptical. As for the area of the circle, we know now that the ancient Egyptians estimated π to be 3.1605. Pretty close (the real value is 3.1415…), but Joseph also points out that “the Egyptian method is not based on recognizing the dependence of the circumference on the diameter (i.e., on the value of π).” In other words, this was an implicit estimate. The Egyptians did not set out to calculate the value of π. The fourth chapter of The Crest of the Peacock focuses on the mathematics of the region of Mesopotamia, which was centered on the Tigris and Euphrates rivers of modern day Iraq. As I wrote last week, a key factor in the development of mathematics in these early cultures was the demand for higher levels of thinking and the resources to achieve them. This is just conjecture on the part of the author and other historians, but the fact that the kingdoms of Mesopotamia relied on large-scale agriculture and irrigation may satisfy both of these requirements. A calorie surplus, as can be achieved through large-scale, coordinated agriculture, would be required to support a class of scribes. And in order to undertake large-scale agriculture, skills such as measuring crop yields and field sizes must have been important. The inhabitants of Mesopotamia lived under the Akkadian, Assyrian, and Old Babylonian empires, among others. Hammurabi, well-known for the legal code which bears his name, was a leader of the Old Babylonian empire. Unlike the ancient Egyptians, who wrote on papyrus, the Babylonians used clay collected from river banks as their medium. These tablets could then be dried or fired for longevity, which is part of the reason why they are so much more prevalent today. In addition to clay tablets, they also used small tokens of various shapes and sizes to represent varying amounts of different goods. A cone-shaped token for a small measure of grain, for example, a sphere for a larger quantity, and so on. These tokens could then be pressed into clay tablets to form a kind of business record or receipt. One can imagine how this system might work well for a small number of items, but once quantities grew large enough it would’ve been useful to have a single symbol to represent multiple items. It’s like keeping score with tally marks – works well enough for soccer, not so well for basketball. 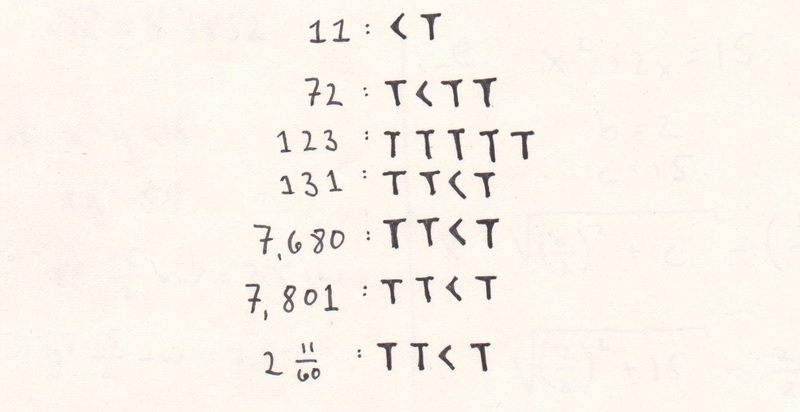 Used a sexagesimal (base 60) counting system expressed with only two symbols, a T-shaped symbol which represented one and an angled symbol which represented ten. Did not use a symbol for zero, which led to ambiguity. Were aware of the properties of the Pythagorean theorem, one thousand years before Pythagoras. Were also aware of Pythagorean triples, as evidenced by the Plimpton 322 tablet. Were able to work an equation to find unknown quantities, which is the basis of algebra. This sexagesimal counting system can be seen today in hour sixty-second minutes and our sixty-minute hours. You’ll also notice it in our description of a circle being made up of 360 degrees. There are many benefits to such a system, chief among them being the number of terms which evenly divide 60: 1, 2, 3, 4, 5, 6, 10, 12, 15, 20, 30 and 60! Ten, the base of our number system, is only evenly divided by 1, 2, 5, and 10. Sad. Does Joseph give too much credit to the ancient Egyptians and the inhabitants of Mesopotamia? I don’t think so. In fact, I think too little or too much credit is the wrong way to think about it. The evaluation of the mathematics of these cultures should rest squarely on the shoulders of the mathematics itself. To do this, simply explain what advancements they made and where they spread. That’s the only way to come to a cohesive understanding of who developed what, and that’s exactly what I think Joseph has done.